The Lady Cans began with one Girl Scout troop looking for more engineering activities to do in 9th grade. Their troop leader started an email conversation back and forth with the Girl Scouts of Central Texas which led to a discussion about FIRST. Girl Scouts secured resources to start a Girl Scout robot team and the Lady Cans were formed. When FIRST Lunacy (the 2009 game challenge) began, we had 6 girls and 2 mentors. The girls learned many new skills, varying from using a hand drill to coding in LabVIEW. As the weeks progressed, the girls became more confident in their knowledge of engineering. 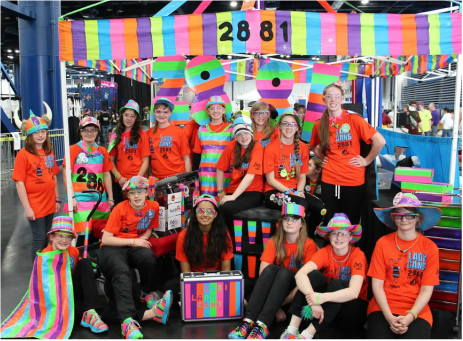 Their 2009 robot "Firstie" competed at the Lone Star Regional and the team brought home the Rookie Inspiration Award. In 2010, the team grew to 12 girls. With more members, we had enough people to expand our activities to include web design and animation. Our robot "Hammer" was very successful at the Lone Star Regional. We qualified to compete in the semifinals and happily received the Judges Award. In 2011, the team added more girls who were introduced to the team through demonstrations and community outreach events. With 14 team members, we split into groups. 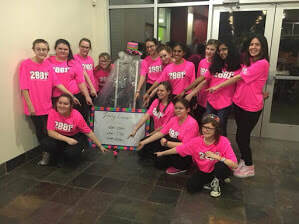 6 girls took responsibility for the Chairman's award activities and 8 girls worked to design, program and build the robot. The Lady Cans competed at the Lone Star Regional. In 2012, the Lady Cans had reached 20 members. The first class of seniors taught their knowledge to the younger girls. An FRC team in Waco, Texas (also sponsored by the Girl Scouts of Central Texas) was started with the Lady Cans’ help. 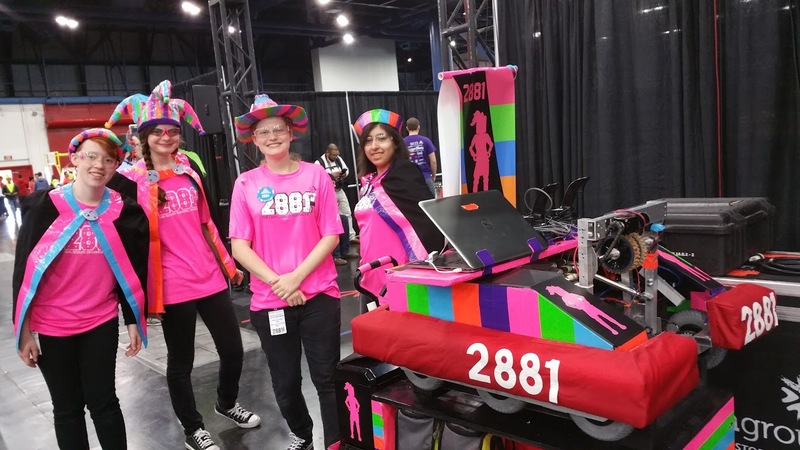 Our Ladies competed at the Lone Star Regional and were selected for the 6th seed alliance. In addition, the Lady Cans' team Captain, Allison, received the FIRST Dean's List Finalist Award. ​The Lady Cans were given the opportunity to attend the 2012 FIRST Championships in St. Louis. Because the week of champions was the same week as TAKS testing, only the six seniors were able to attend. Championships was an amazing learning experience for the seniors and they were excited to tell the rest of the team all about it. ​In May of 2012 we were sad to see all of our founding members graduate. Many of them went on to further their education in college and information about that can be found here. ​2013 was a new year for the Lady Cans. While the team was slightly smaller in numbers this group of girls were highly motivated and committed to the team. They once again were excited to attend Lone Star Regional and were glad to continue mentoring their sister team, 4335 the Metallic Clouds of Waco, Texas. In 2014 we built two robots for the first time; one to "bag and tag" for competition and the second to test code and practice driving. Our ladies also attended two regionals, the Alamo Regional in San Antonio and the Lone Star Regional in Houston. We very happily took home the Spirit Award from both. At Alamo we made it to quarterfinals with alliance mates 3320 and our friends 3999 Shadetree. At Lone Star we made it to semifinals with alliance mates 3847 and 4587. In addition, we attended 3 off-season competitions: Texas Robotics Invitational in Houston, Robo Reboot in Fort Worth, and Texas Robot Round-Up in Austin. 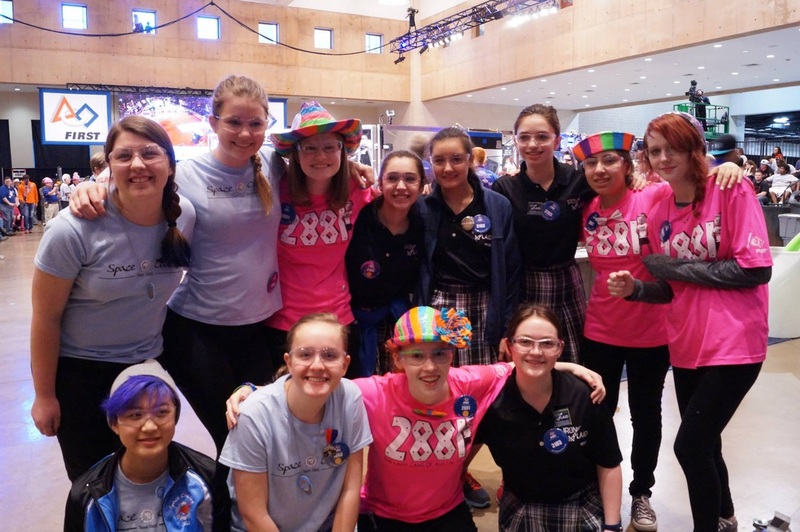 In 2015, the Lady Cans attended the Alamo Regional and were very excited to be part of an all girls alliance with team 1868 the Space Cookies and team 3103 Iron Plaid. We were overjoyed to take home the Imagery Award from the Alamo Regional. In 2016, the Lady Cans attended the Alamo and Lone Star regionals where we advanced to quarter finals and achieved the engineering inspiration awards at both. At the Alamo regional, our team leader Stephanie became a dean's list finalist. We were successful enough to advance to Championships, where we happily ended our season. In 2017, The Lady Cans attended the Lone Star North and Lone Star Central regionals, where we were lucky enough to advance to the Championships in Houston. While at the Lone Star regionals we gained the team spirit, regional chairman's, and Wood Flowers finalist awards. While at the Houston Championships, we competed in the Roebling division. During this year we had a boom in population as many girls across Austin joined the team. In the 2018 season we shifted from using LABview to using java, and saw a rise in girls interested in programming on our team. This was the last year we would participate in competition under the regional system (In 2019 the state shifted to a district system) where we attended the Lone Star Central and Lone Star North regional competitions. We took home the Creativity in Design and Gracious professionalism rewards, and out team leader Vivian became a Dean's list finalist. This was the year we really branched out in the programming field, and our hard work paid off as we gained a new understanding of Java.